Join Editor-in-Chief Joshua Heston along with Ethan Grubaugh and Dale Grubaugh to talk about hillbillies, growing up in the Ozarks, the Toby Show, Silver Dollar City memories, and Josh’s editorial Cornbread Dignity. Podcast Partners: Shepherd the Musical: Rediscovering America’s Story, Stafford’s Barber Shop & Shave Company: The Place for Men in Downtown Branson, Taney County Health Department: Creating Opportunities for Healthy Lives in Our Community, and Blue Rock Print Company: Upgrade Your Look! Last month, I interviewed Jae McFerron (longtime Missouri comedian and actor) regarding the famed and soon-to-be-reborn Toby Show. And — for the first time — I watched the Toby Show on Youtube. What does that mean? Rural values? A historic aside written by forgotten Midwestern hicks? Our nation was founded on the idea of individuality. Freedom of thought. Freedom of speech. Rights inalienable. Thomas Jefferson dreamed of a pastoral North America in which prosperous farms dotted the landscape — a generous, peaceful, prosperous empire of gentle farmers. One Civil War and an industrial revolution later, Jefferson’s dream was in shreds. In the 20th century, America emerged powerfully on the world’s stage, increasingly called upon to save the Western world, or at least remake it in the wake of World War II. At a price. Individuality and freedom. Traded away for a good job, a good education, a good cubicle, 2.3 kids and a nice home in the ‘burbs. But human beings are not industrialized robots. And by the 1960s, the Toby Show went mainstream with Paul Henning’s Beverly Hillbillies. Here in the Ozarks, Silver Dollar City would become America’s epicenter of hillbilly mythos. 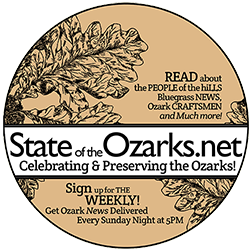 Ozark hillbillies: A history that never was and always will be. In the mythos, hillbillies are America’s ultimate individuals. Hillbillies live in a mountainside shack, far from the demands of homeowner’s association, corporate management, or academia. There is freedom of life, expressed in moonshine stills, lively fiddling, front-porch stick whittlin’, and all-night fox hunts (just to hear the dogs bay in the mountain moonlight). That’s what brought Americans back to these White River hills in droves. Not the advertising. Not the big-name entertainers. Not the admittedly delicious funnel cake. But here was a place where Americans — if but for a moment — could reclaim a lost heritage and a human need. To be ourselves. Whatever that might be. And rediscover our own cornbread dignity.